Downtime may be impossible to prevent, but the vast majority of outages can be fixed with a simple reboot. iBoot®, a web-addressable remote power controller, enables you to reboot remotely, so you can restore a downed device from anywhere you can access a web browser. Why spend money on an IT visit or drive all the way downtown just to flip a little red switch, when iBoot® can do it for you? With iBoot®, you no longer have to waste time or money going onsite to reboot downed equipment. 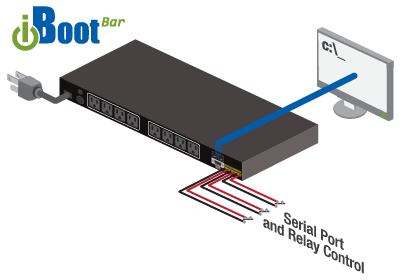 iBoot® is easy to set up, easy to use, and is perfect for remotely rebooting servers, kiosks, ATMs, digital signage, workstations, servers and any other machines on a distributed network. Pays for itself with the first service call saved! Why waste time and money racing around to do no more than push that big red button. With iBoot®, you can control power and get automatic reboot ANYTIME – ANYWHERE. Don’t let a crashed system ruin your day. Save Time, Money and Reputation with iBoot. From servers and webcams to IP PBXes and surveillance systems, iBootBar keeps your network up and running. When you need to reduce costly site visits, ensure business continuity and increase network reliability, iBootBar gives you peace of mind. 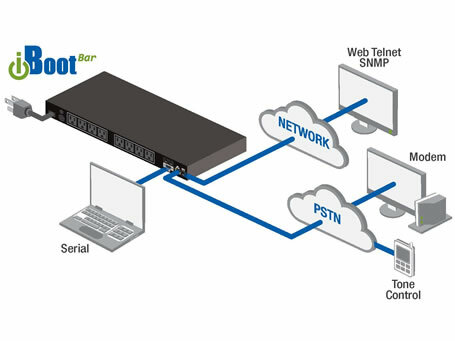 iBootBar, a web-accessible, managed PDU for eight independently controlled outlets, enables multiple users to reboot remotely from anywhere, using any web browser, Telnet client or SNMP manager. 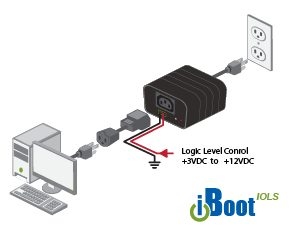 Leverage your existing GPIO contact closures or logic levels into A/C power control with iBoot-IO. A single outlet power switch with I/O control, iBoot-IO allows you to easily integrate remote power control into your existing management system and manage devices remotely. iBoot-IO is perfect for remote reboot, test automation, environmental control, security access or any remote or automated facilities. Serial iBootBar saves you time and money by simplifying power distribution and giving you the ability to monitor and control your devices remotely. When you need to reduce costly site visits, manage power distribution and increase network reliability, Serial iBootBar puts the power in your hands. Remote power control for reboot, energy management, environmental control or test automation is easy to manage through serial command or GPIO contact closures. With Serial iBootBar, you can remotely detect and respond to physical events like gate openings or spikes in temperature, humidity or pressure – or simply reboot your devices wiuthout going onsite.